Shake the brandy and lemon juice with ice cubes. Strain onto new ice and top with ginger ale. Garnish with a spent lemon shell. I am not loving this base spirit (brandy) in a Buck. It might be because I'm using a rather light Cognac (Landy VS). The drink doesn't taste bad, just a little thin. I tried this right after an out of the park New Orleans Buck which had all kinds of flavors going on - maybe the opening act was too good for the closer? 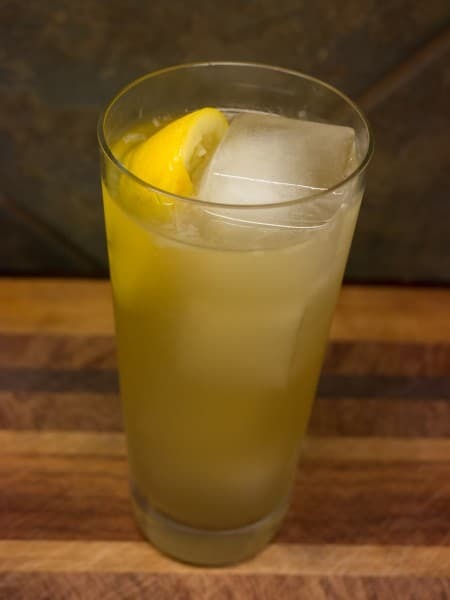 I did use an on the spot ginger beer preparation consisting of 9 drops of Jamaica Ginger, a pinch each of citric and tartaric acid, 2 heaping teaspoons of double strength simple syrup and 3 ounces of club soda for the topper. Everything got shaken except the club soda. While Jamaica Ginger makes a good ginger ale or ginger beer (use less or more respectively), I'm thinking you need more than that to make a really tasty ginger beer. The acids help give it some snap but it's not quite the same. Or maybe brandy and ginger ale aren't meant for one another? I can hardly believe that as a Brandy Buck was quite a popular drink during it's heyday (before gin started to poach bartenders to it's side). I'd be interested to hear what the readers think. Next time I will try Camus VS Cognac.